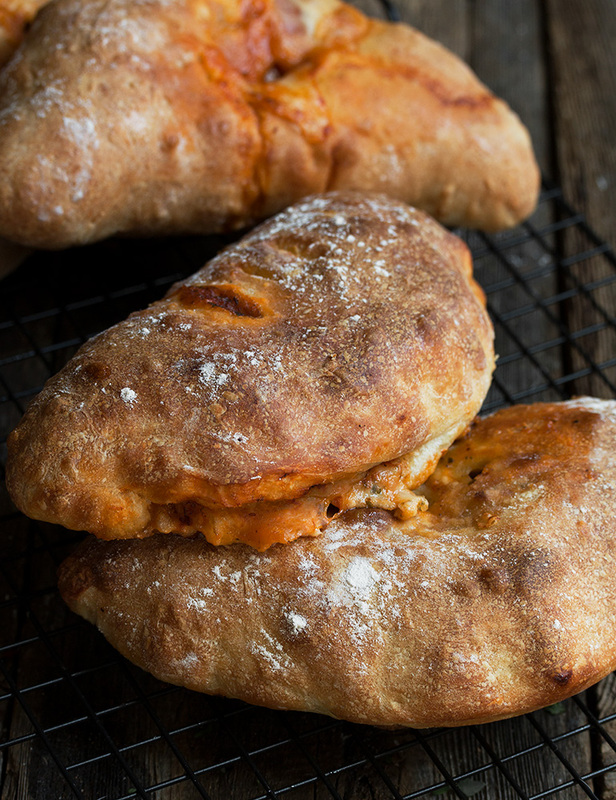 A nice change for pizza night, these Easy Calzones use store-bought pizza dough and feature two great filling ideas, with a great list of more great calzone fillings for you to try, too! Friday night is typically pizza night at our house. 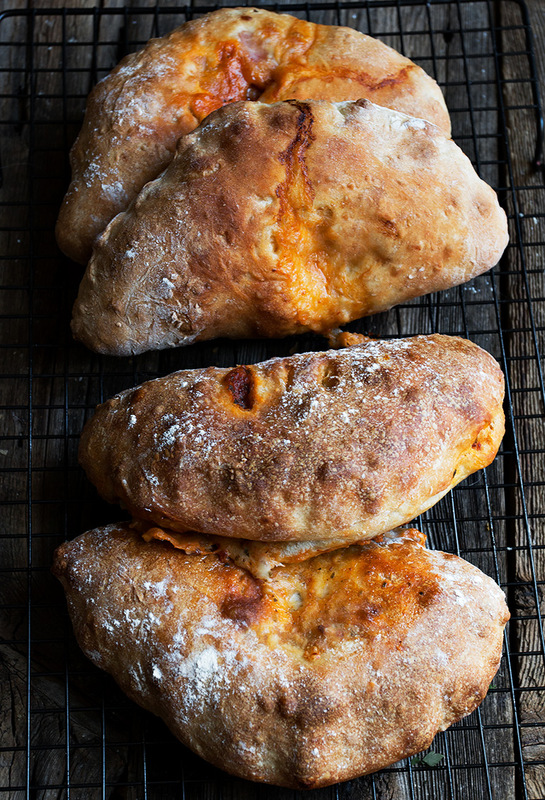 When we’re in the mood for a bit of a change up, we look to calzones! Calzones, of course, are just pizza in turn-over form. 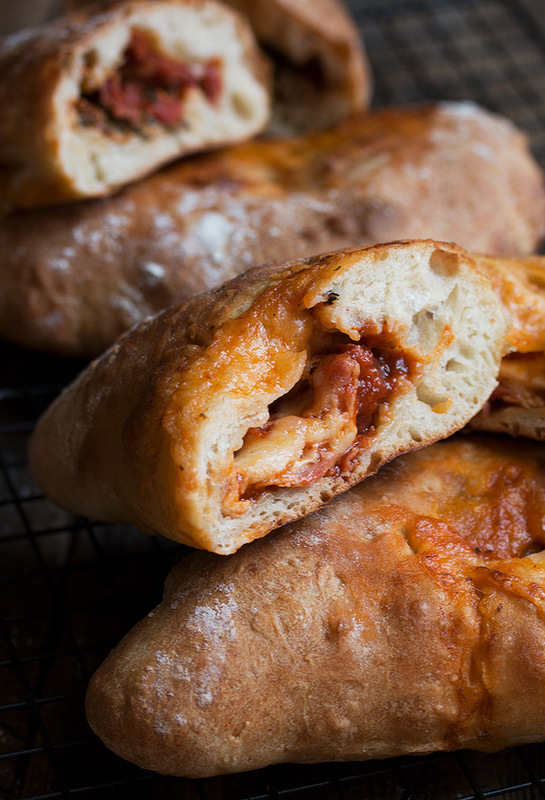 To make these easy calzones, I started with a good quality, store-bought pizza dough, but you can easily use your favourite homemade pizza dough instead, if you prefer. 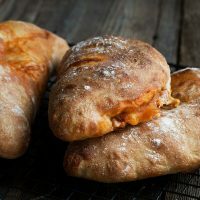 Most authentically (in Italy :), calzones always feature ricotta cheese and would likely be served with a marinara sauce on the side rather than having a tomato sauce inside. The calzones here are probably more of an adapted North American style, using typical pizza toppings as calzone fillings. For my calzones here, I made two varieties – 1) a vegetarian calzone using sundried tomatoes, pesto and bocconcini and 2) a Genoa salami, roasted red pepper and provolone version. Both were delicious and delightfully different. 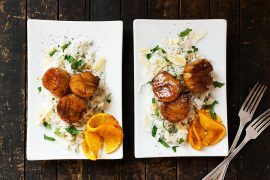 It’s fun to make a variety and cut in half to serve, so people can enjoy a variety of flavours. Traditional Spinach-Ricotta Calzones (Vegetarian): Sautéed onion and garlic, baby spinach, mozzarella, ricotta, and tomato sauce. Pulled Pork or Chicken Calzones: Pulled meat, barbecue sauce and a sprinkle of cheese. Wilted Greens Calzones (Vegetarian): A whole mess of greens (kale, chard, beet greens), wilted with garlic and red pepper flakes. Ricotta, mozzarella and/or Jack cheese. Indian Curry Calzones: Left-over curry (removing solids from any excess of sauce) mixed with wilted greens. Thanksgiving Calzones: turkey, a little gravy, stuffing, and cranberry sauce. Obviously, if your pizza dough is frozen, thaw in the fridge ahead of time. It’s ok to start with cold from the fridge dough or room temperature dough. For each calzone, start with a dough ball of about 5 oz (150g). If you’re eyeballing it, it’s about the size of a small apple. Roll out your dough pieces in to a circle about 7 inches in diameter, for a nice size serving. You don’t want to roll it too thin for calzones. Even if you are typically a thin crust pizza lover, for calzones, too thin risks blowouts as the filling cooks. While the sky is virtually the limit as to what ingredients you put inside your calzones, try to use ingredients with the least amount of moisture, to avoid soggy middles. 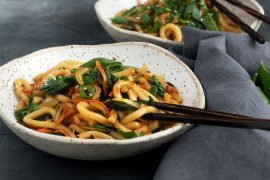 So for example, if you want to use mushrooms or zucchini, pan saute them first and cool on a paper towel to remove much of the moisture before using them in a filling. Likewise, consider sundried tomatoes (or oven roasted) instead of fresh. Jarred vegetables such as artichokes and roasted red peppers are a great option. Just be sure to dry them on paper towel before using. When adding your fillings, don’t be skimpy and keep them away from the edges (it’s hard to seal if there is sauce in the edges!) Place a good sized mound of filling and stretch the dough gently over the mound to encase. The fillings will cook down as they cook and it ensures that you end up with a good balance of dough to filling. Be sure to seal your calzone well and completely, to avoid leakage, making sure you get right to the corners. Wipe away any sauce that is along the sealing edge before sealing. 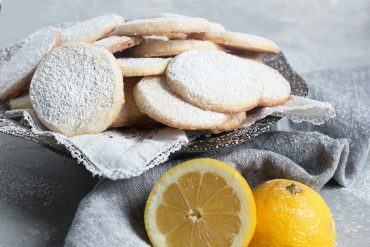 Lightly flour your fingers with flour to avoid sticking. A fork or pasta cutter also works well. Before placing in the oven, be sure to cut a couple of small slits in the top, to allow the steam to escape as they cook. Allow them to cook the full time, even if they seem cooked on the outside before that. It takes time for the inside to cook! Divide pizza dough in to 4 equal pieces (about 5 oz. each). On a well-floured surface, roll each piece in to a 7-inch circle. Working on the bottom half of the circle only, spoon a dollop of pizza sauce in to the centre, avoiding the bottom outside edges of the circle. 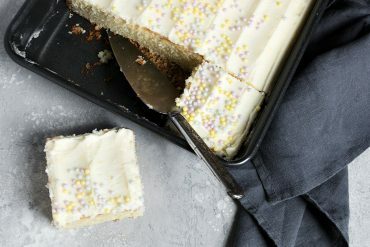 Place a good-sized mound of filling ingredients on top, again, avoiding the bottom outside edges. Lift the top of the circle up and gently fold over the filled bottom of the circle, lining up the edges. Wipe away any sauce that may have moved to the edges. Firmly seal the edges together, using floured fingers if sticky, being sure to seal all the way around well. Place calzones on a parchment lined baking sheet. Before placing in the oven, cut a couple of small slits in the top to allow steam to escape. Bake in preheated oven for about 20 minutes, or until top is deep golden to brown in spots and firm. Remove from oven and allow to cool a few minutes before serving. 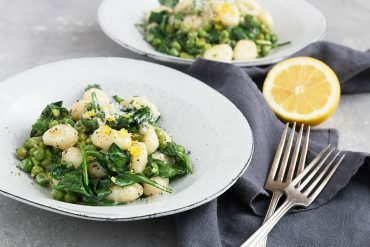 Serve with additional pizza or marinara sauce, if desired. 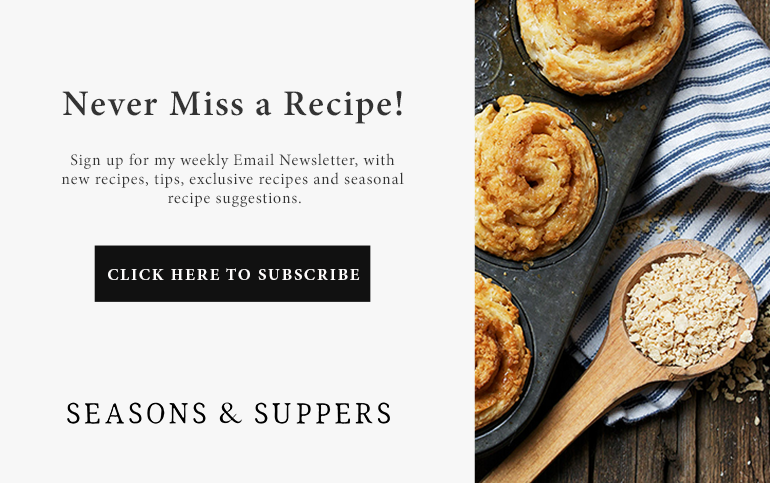 Notes: *Looking for a great homemade pizza and/or pizza sauce recipe? I love Jim Lahey's no-knead pizza dough. You do need to start it 18 hours ahead, though, so plan accordingly. I also have a great homemade pizza sauce recipe. You'll find both the Lahey dough recipe and my homemade pizza sauce recipe on my Chorizo pizza post. LOVE these Jennifer! And love your list of fillings. 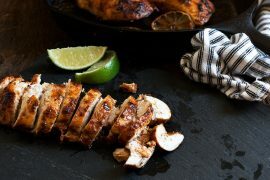 I will need to get these on the menu for my son Casey when he gets home on weekends this summer! Thanks Mary Ann :) And yes, it’s a fun meal and everyone can make their own with whatever fillings they like! Yum, homemade pizza is a night-in standby in our house, but I agree it is good to change it up now and again! Thanks Abbey :) As much as I love homemade pizza, I do enjoy the change once in a while! These calzones are so tempting Jennifer, I may just make some for dinner tonight. They will go so well with Chris’ new summer blonde ale! 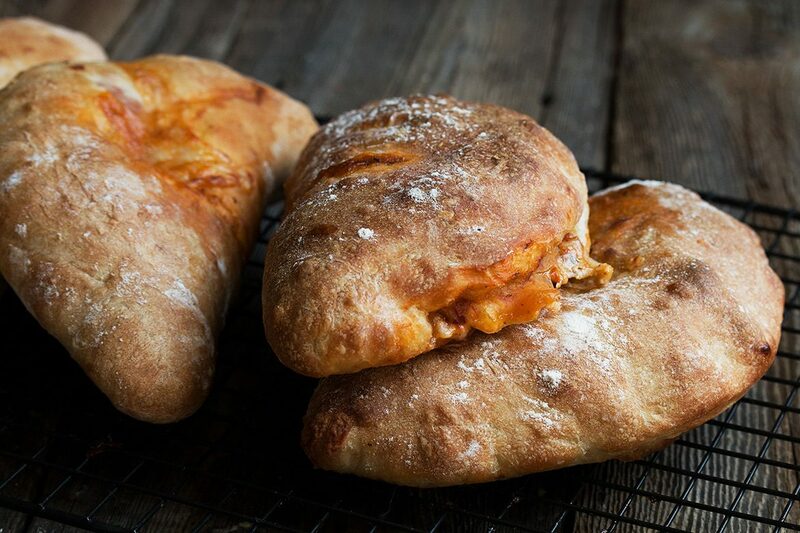 Mmmmmm these look so pillowy and delicious, I haven’t had a calzone in so long, but we used to get them all the time when I was growing up in New York ~ I can’t wait to try these! We haven’t had calzones in ages! 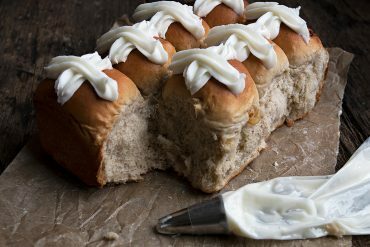 Your little pockets are beautiful and the filling ideas are all great. Love your tips about fillings and moisture. 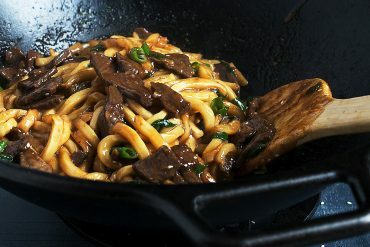 Great idea to cook out the moisture first in mushrooms and zucchini. I am craving pizza flavored calzones now, thanks!